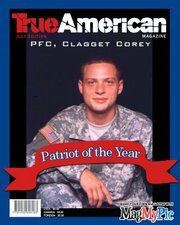 We thank you sir for your service and patriotism. At times however we have wondered what side you are on. A Republican you are not. Sen. John McCain (R-Arizona) is raging mad at MSNBC host Chuck Todd, who was reportedly caught joking about McCain having “heart palpitations” upon discovering that former Gen. David Petraeus opposed further intervention in Iraq. “It’s not like further evidence was needed to prove the liberal bias at MSNBC and in the mainstream media, but Chuck Todd’s ‘hot mic’ comments asking if anyone ‘checked on’ Senator McCain for ‘heart palpitations’ over General Petraeus’ remarks on Iraq show just how quickly the media will try and discredit Senator McCain and anyone who questions President Obama,” McCain’s communications director, Brian Rogers, said in a statement. The alleged hot mic incident occurred Thursday before President Obama announced he would send a limited force of 300 advisers in Iraq. According to Mediaite, Todd and Fox News’ Ed Henry mocked McCain over Petraeus’ Wednesday warning against further intervention in Iraq. “I’ve got to think McCain must have had heart palpitations,” Todd joked. But McCain’s spokesman argued Petraeus’ position was more nuanced. Rogers pointed to a Thursday report indicating Petraeus supported targeted strikes against the antigovernment military forces in Iraq. “It should be embarrassing for MSNBC — but likely isn’t — to see that in another interview just one day later Gen. Petraeus said he would support targeted strikes against the ISIS terrorist army in Iraq, which is what Senator McCain has advocated — so no ‘heart palpitations’ necessary,” he snarked. McCain is no stranger to media criticism. Rogers similarly fumed at Politico in May for misrepresenting the senator’s policy views. An MSNBC rep did not immediately return a request for comment from Business Insider. By Jim Campbell, Citizen Journalist, Oath Keeper and Patriot. 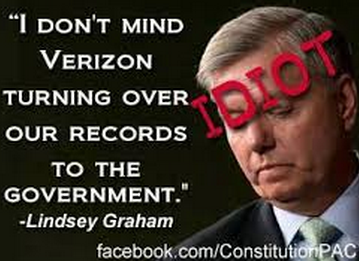 Ms. Lindsey Graham is a RINO’s RINO and certainly is not a man of any substance. If there were a senate state on another planet called “Goes which way the wind blows, Ms. Lindsey would be the perfect candidate. Think about that for a moment will you? The Republican Party stands at the precipice of leading America back from the cultural, economic, legislative and diplomatic disasters of the Obama years, except that in recent decades it has proven itself devoid of the necessary courage, leadership, or ideology to accomplish such a feat. Instead, it predictably reverts to what the party insiders consider politically “safe” ground, with the main goal being to avoid controversy at any cost, including the forfeiture of its very soul. The dismantling of America’s medical services that directly resulted from the ensuing nightmare of Obamacare should have been recognized and seized as a golden opportunity for the GOP to completely reverse course, thus giving the nation a chance to restore its formerly unrivaled level of treatment. Meanwhile, the issue has polarized the people against the Democrat Party to a degree not seen since the early 1990s, thus providing an occasion to discredit the entire liberal agenda and begin repairing the devastation caused by it. So, of course, the reasoned response from the political “experts” of the Republican Party establishment is to continually scale back any notion of actually repealing Obamacare, and suggest as an alternative some insipid “fixes” that might abate its worst aspects without overly angering those who support socialized medicine in America. Anything of greater magnitude might be labeled “extreme” by the media, which would simply be unacceptable to those erudite Republicans. The recent primary election wins of House Speaker John Boehner and Senate Minority Leader Mitch McConnell are proving to be timely for the party elite, who brought big money into those races to preserve the Beltway status quo. Consequently, they can claim with an appearance of credibility that their chosen candidates will fare far better than hapless conservatives with their fixation on such annoyances as integrity and principle. Let everyone be relentlessly reminded of Todd Akin, and forewarned of a similar fate for those who fall into the disfavor of the party elite. Yesterday’s act of surrender by the GOP leadership, in accepting the Democrat-RINO “deal” to end the government shutdown should finally show us it’s time to make a real and serious effort to clean the House, and the Senate, of RINOs. The progressive RINO Republicans and progressive liberal Democrats, along with the White House that is destroying this country, cut a deal to get what they wanted and screw us, the American people, in the process. Erick Erickson’s commentary at RedState this morning, titled “Advancing. Ever Advancing” is spot on right and it’s a good start. He reminded us about the leadership provided by Senators Ted Cruz and Mike Lee, and how we can send them more allies as senators by electing solid conservatives in the senate races in several states. While I’m not yet sold on Matt Bevin in Kentucky, who is challenging Mitch McConnell in the primary there next year, because it seems he might be more of a Christine O’Donnell than a Rand Paul or a Ted Cruz. While we do need to flush out the RINOs, it doesn’t advance us if we defeat an incumbent with an entirely incompetent candidate who will definitely turn the seat over to the Democrats in the general election as did Christine “I’m not a witch” O’Donnell did in Delaware in 2010. But RINOs like Lindsey Graham definitely must be defeated in primaries with good conservative candidates. We need to do the same in the House races too, starting with supporting J.D. Winteregg, who is challenging John Boehner for Congress from Ohio. Every members of Congress who under-performs on the Madison Project index needs to be challenged in the primary in an effort to nominate a more conservative electable candidate. In order to win, Republicans must present the voters a mainstream conservative vision of prosperity, freedom, and American Exceptionalism rather than big government, political correctness, and America as a nation in decline. Republicans don’t win being moderate and positioning themselves as Democrat Lite. Elections have consequences. We’ve elected too many moderate and liberal Republicans to seats that could and should be held by solid conservatives more like Ted Cruz and Mike Lee. 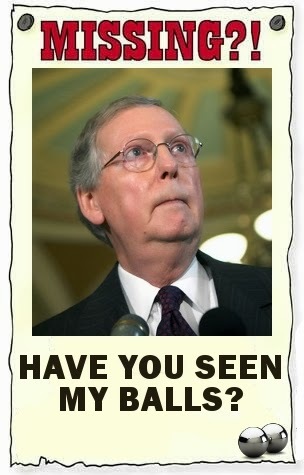 Yesterday’s cave-in by the GOP leadership proves that again. As the saying goes, ” Live by the sword, die by the sword, thus Eric Cantor was snuffed by the party he helped create. Next up sticking it to House Speaker, John Bohner would add a nice touch. Earlier today in the Capitol, Majority Leader Eric Cantor’s press aides did not seem the least bit perturbed. Virginia political guru Larry Sabato’s political newsletter said the question was whether he would get 60 percent. Even Breitbart – one of the only publications to cover the race seriously – downplayed primary challenger David Brat’s chances of victory. But as the results began to stream in, the entire political world watched with utter shock: the sitting Majority Leader was being deposed by a political novice economics professor with no money. In an election cycle about the Establishment striking back, one of the most shocking electoral upsets in modern history happened while the the political world was yawning. The story about how David Brat pulled off such a monumental surprise win starts, and almost ends, with immigration. Throughout the campaign, Brat was relentless in his attacks on Cantor over the issue. Meanwhile, tens of thousands of illegal alien children were streaming across the border, creating a border security crisis. Cantor was ham-handed in his handling of the issue. He quietly backed an effort to pass the “ENLIST Act,” which would grant amnesty to “DREAMers” who enlist in the military, then turned sharply and took credit for blocking it from a floor vote. In this small election, voter fraud was likely a problem as well. Why do you suppose the left is adamant in killing voter identification? This will bode well for Republicans in races against Democrats and RINO Republicans like Eric Cantor, recently deposed House Majority Leader and Whip. The left historically has not turned out for mid-term elections and it is unlikely they will in the 2014 election cycle. TURNOUT: California’s low turnout rate due to flaws in the voter rolls, and the potential for fraud, experts say. Embarrassingly low voter turnout in Tuesday’s primary highlights problems with the Golden State’s voting rolls. Only 13.19 percent of registered voters in Los Angeles County participated in the primary, according to the L.A. County registrar. While the Los Angeles Timesattributed the low participation rate to contented voters, voter integrity groups sayﾠvoters believe their ballots don’t matterﾠbecause of the flawed system. Ellen Swensen is chief analyst at theﾠElection Integrity Project, a volunteer organization that works to protect fair and honest elections in California.